This study, based on the premise that references are a social product that reflects the social environment of a society, is an attempt to explore the co-existence of Korean and non-Korean literature in the references to Korean papers. 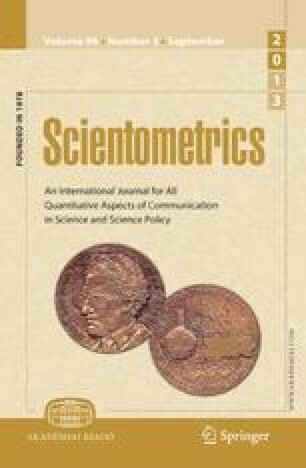 321 authors (papers) who published in 43 issues of 24 Korean journals focused on the social sciences were surveyed about their research channels and citation motivations, and the 11,358 references in the papers were analyzed. The findings were as follows : (1) The extent of the co-existence was that non-Korean literature was cited 1.9 times (65.3%) more often than Korean literature; (2) Research channel was the most common non-Korean channel orientation (55.8%); (3) The motivation for citations was significantly dependent on whether the literature cited was Korean or non-Korean. Non-Korean literature was chiefly cited for conceptual (20.7%), perfunctory (16.0%), and persuasive (15.1%) motivations; (4) The citations and citation motivations behind non-Korean literature were significantly influenced by research channel, discipline, focus of research, publishing career, and type of paper. Of these variables, research channel was frequently related to the citation of non-Korean literature. Finally, this study is very suggestive on two counts: (1) Citation motivation might constitute a new approach for exploring the production of knowledge by researchers. (2) This study has demonstrated, in particular, an empirical relationship between knowledge produced by Korean social scientists and non-Korean knowledge through the analysis of citation motivation.